Tapco concrete base resists high wind gusts. 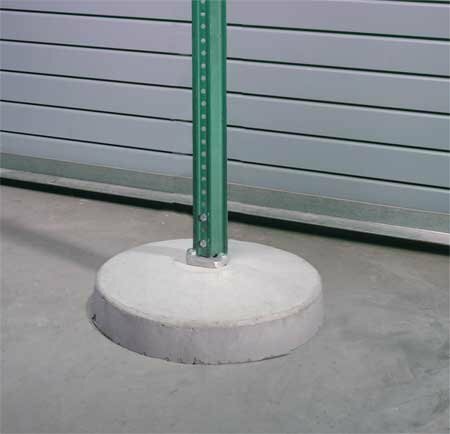 Concrete base with 18-inches nesting sleeve accepts 2-1/4-inches square post. Base comes with 6-feet height U-channel post. White color. The 2 3/8" Round Post Surface Mount is ideal for parking lot and subdivision signage assemblies. 4 concrete expanding anchors affix the surface mount to the ground, and 2 3/8" set screws hold the post into place. Mount your sign on these rugged steel U-Channel Sign Posts from ACCUFORM SIGNS. Posts can be set in ground, concrete or portable base. 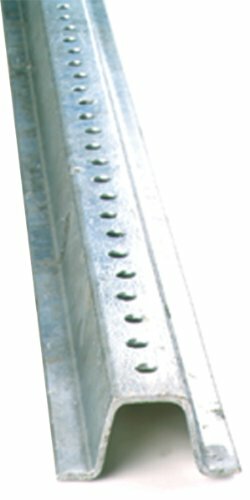 U-Channel Posts have 3/8" holes on 1-inch center along the length. The HSP109 8-ft post is Heavy Weight 2.00-lb./ft. Approved by the Federal Highway Administration (FHWA) by meeting the NCHRP-350 criteria. Galvanized finish. 6' Galvanized FlexPost Sign Post with Concrete Mounting Base FLEXPOSTs are the long-term solution for ongoing sign maintenance problems in areas where signposts are vulnerable to traffic and other hazards. Flexpost's spring assembly allows uniform flexibility when hit from any angle. Even when completely driven over, Flexposts easily return to their original position leaving minimal, if any, scratches on most vehicles. 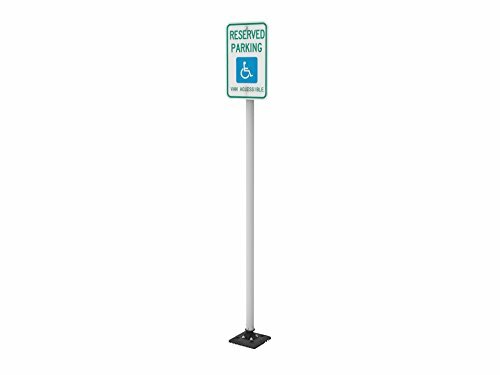 Flexposts are ideal for handicap, fire lane, directional, and special-use signage such as Expectant Mother, Short Term Parking, and Loading Zone. 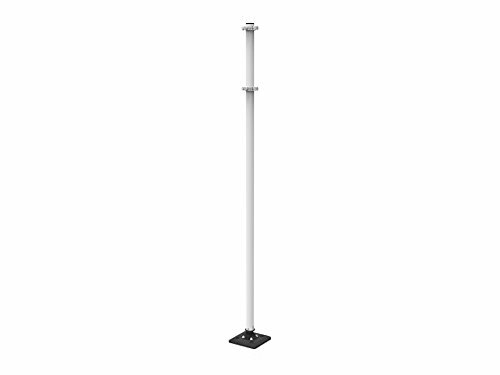 This post can handle signs up to 36"x36" in size. 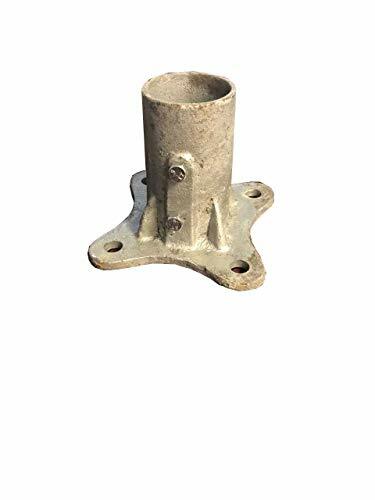 In addition to the 6' post and the "above ground hardware" like the spring assemble, you also get the under ground hardware for attaching the FlexPost to a concrete surface. 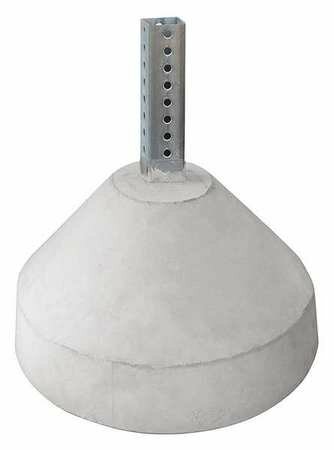 That underground hardware consists of... Four 1/2" galvanized concrete expandable studs. Four 1/2" galvanized nylon insert lock nuts. Four 1/2" galvanized washers. This highly durable, yet lightweight sign post is constructed of a white powder coated aluminum post that prevents warping and remains straight even in harsh summer or winter conditions. It is easy to install in asphalt or concrete and utilizes our patented, anti-twist, reactive-spring assembly for optimal strength and performance. The compression spring is designed to allow the sign post to withstand low speed bumper hits and return to its original position without damaging the sign or vehicle. Our Sta-rite sign post is ideal for traffic parking lot locations. They are especially useful in lots without car stops. Anchors included. Made in the USA. Mount your sign on these rugged steel U-Channel Sign Posts from ACCUFORM SIGNS. Posts can be set in ground, concrete or portable base. 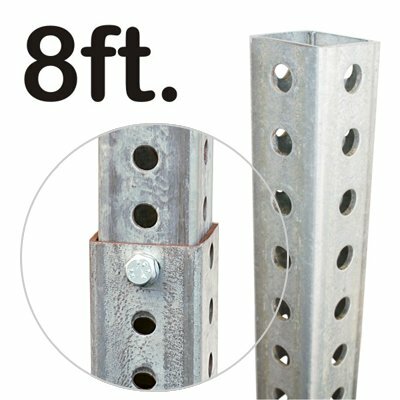 U-Channel Posts have 3/8" holes on 1-inch center along the length. The HSP102 6-ft post is Heavy Weight 2.00-lb./ft. Approved by the Federal Highway Administration (FHWA) by meeting the NCHRP-350 criteria. Galvanized finish. This highly durable, yet lightweight sign post is constructed of a white powder coated aluminum post that prevents warping and remains straight even in harsh summer or winter conditions. It is easy to install in asphalt or concrete and utilizes our patented, anti-twist, reactive-spring assembly for optimal strength and performance. The compression spring is designed to allow the sign post to withstand low speed bumper hits and return to its original position without damaging the sign or vehicle. The Sta-Rite Sign Post System is ideal for traffic parking lot locations. They are especially useful in lots without car stops. Anchors included. Made in the USA. Industry Leading DurabilityWith an outdoor life of at least 10 years, our sign posts certainly are the most durable in the market. U-channel sign posts look brand new even after years of exposure to sun, wind, and weather abuse. Baked-enamel coating extends the life of posts and makes them rust-proof.USA’s Oldest Traffic Sign Post ManufacturerFamily owned since 1918, we take immense pride in our sign posts. Being one of the oldest certainly means we know this business in and out. Our South Dakota factory is the oldest manufacturer of metal signs and sign posts in the USA. Heavy-duty sign posts are maintenance free and ensure that your signs stay in place for years to come.CompliantOur 8 feet tall and 3-1/16' wide sign post is compliant with NCHRP (National Cooperative Highway Research Program) 350 and approved for nationwide use. Mount your sign on these rugged steel U-Channel Sign Posts from ACCUFORM SIGNS. Posts can be set in ground, concrete or portable base. 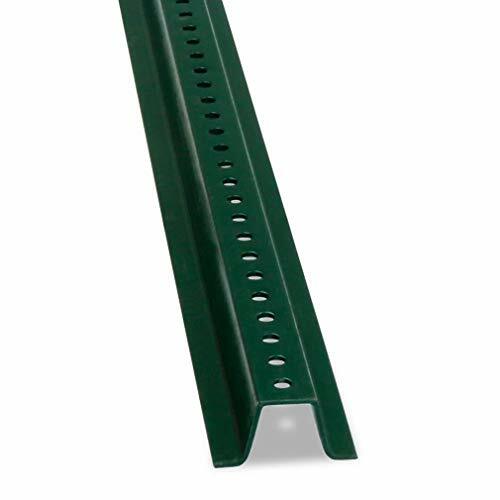 U-Channel Posts have 3/8" holes on 1-inch center along the length. The HSP108 8-ft post is Heavy Weight 2.00-lb./ft. Approved by the Federal Highway Administration (FHWA) by meeting the NCHRP-350 criteria. Green finish. Simple yet essential, the Alpine Industries Building Signs provide important information to your customers and patrons – whether it’s to guide them to a certain location in the building, explain rules of the facility or inform of any restrictions. Using bold text and – in most cases – graphics, each sign provides clear identification for anyone attending your establishment. These signs are expertly crafted of durable ABS plastic for long-term strength and use, resistant to chemicals, heat and impact. The material is also easy to clean with a damp cloth when dust or dirt accumulates on the surface. Boasting great color contrast, the sleek signs are furnished with white lettering and graphics against a black background or red lettering and graphics against a white background. These palettes make the text pop and stand out, allowing your customers to see and read the sign from across the room or down the hallway. Alpine Industries' Building Signs are available in either a 6” x 9” or 3” x 9” size to accommodate your needs. 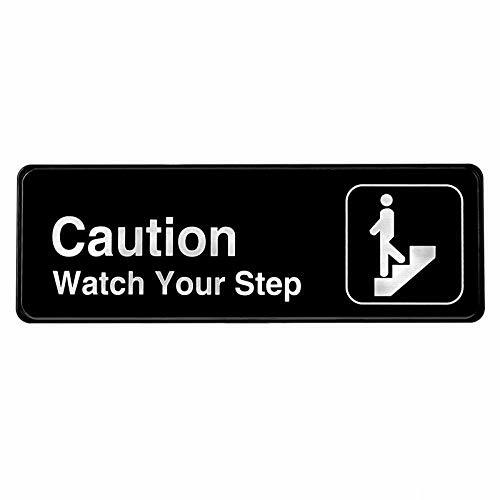 Effortless to transport and hang, each sign also includes a self-adhesive backing. As such, you can carry it to your destination and simply mount it onto any wall or door – ensuring everyone is informed and good to go. 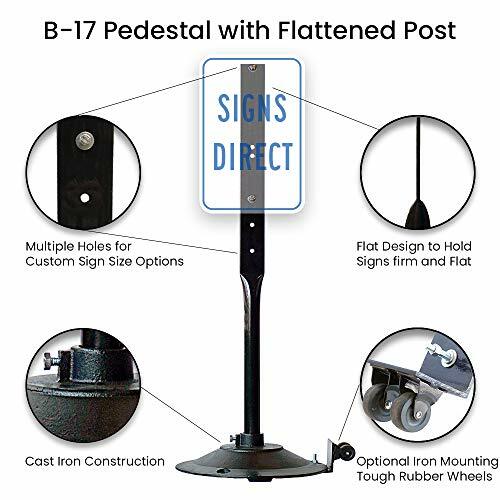 B-17 32 lb Sign post & Pedestal Base with flattened post. 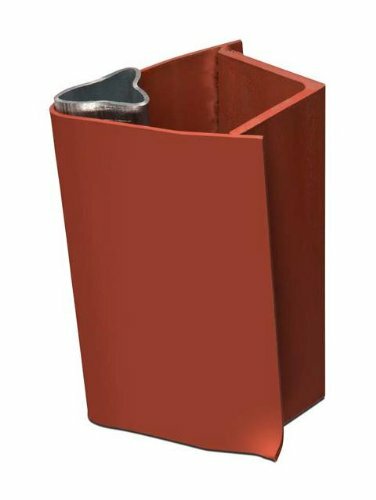 They are ideal for many applications including shopping centers, apartment complexes, fire lanes, airports, parking ramps and handicapped areas. They're also ideal for Reserved and No Parking signs at places of business. This item comes with a 48" tall post (2" OD PIPE). The post has a baked enamel finish. The post is drilled for mounting a standard 12" tall, 18" tall or a 24" tall traffic sign (Signs Not Included). This post has a 17" diameter cast iron base. The combined weight of the post and base = 32 lbs. It also has mounting holes that allow you to use concrete bolts to secure the cast iron base to the pavement for a permanent installation. High-density closed cell polyurethane foam for setting all kinds of poles and posts. 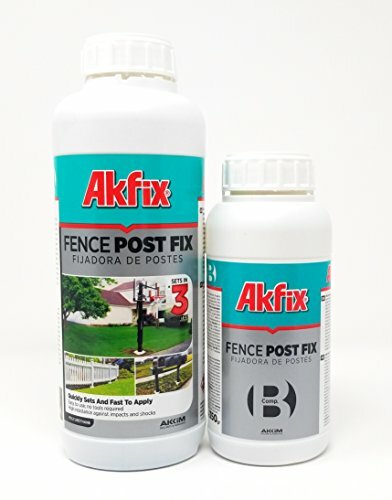 Akfix fence post Kit is an alternative to traditional concrete, works extremely fast, sets in 3-5 minutes. It is waterproof and protects your posts below ground line. Polyurethane components are moisture sensitive. Therefore they must be stored sealed at all times. Holes wider than 9.8 inches is not recommended. In hot weather, 2K foam will react very quickly, do not over mix. Never allow the foam to start to expand inside the bottle. If the bottles are below the recommended temperature before mixing, it will take longer to react, expand and set, and will produce less volume. If the bottles are above the recommended temperature before mixing, it will react, expand and set faster, lowering the working time and will produce a higher volume, weaker composite. 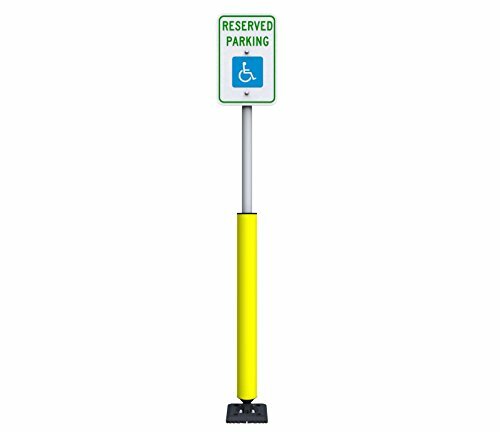 These 6' parking wheel stops help keep your lot organized by guiding cars when pulling into a spot. Our wheel stops are molded with highway reflective tape to increase visibility and safety. The low 4" height and rubber construction lets the driver know when to stop without damaging their vehicle. Tapco V-Loc round breakaway post anchor. V-Loc is the state of the art, reusable breakaway anchor, allowing you to replace posts literally in minutes. 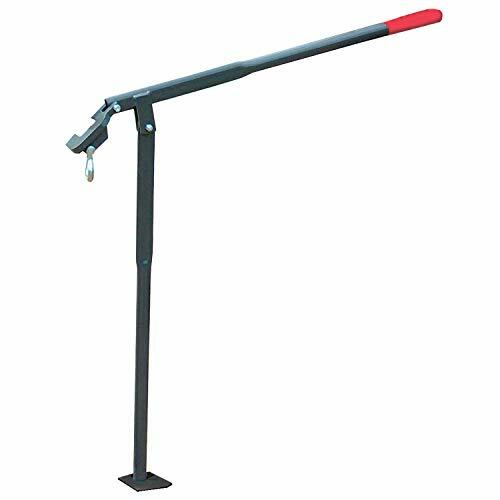 It anchor posts for signs, mailboxes, flexposts, fences and markers. It's simple, solid and safe. Once the V-Loc anchor is installed, you simply insert your post and drive in the patented wedge, locking the post into the anchor without the need for any additional hardware. 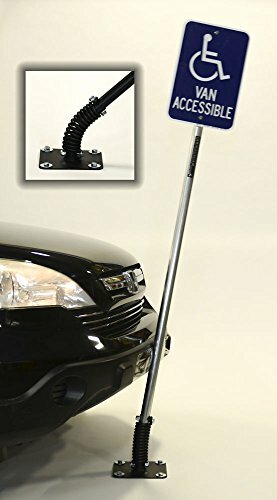 V-Loc's unique, patented, yield and release system allows posts to release or break away at ground level, so errant vehicles pass over the anchor, minimizing the potential for punctured tires and vehicle roll-overs. After a knockdown the socket is re-usable, requiring only the replacement of the locking wedge and post. You save re-installation and money on every knockdown. V-Loc is NCHRP 350 approved, AASHTO recommended and Federal Highway Administration - Clear Zone Compliant. 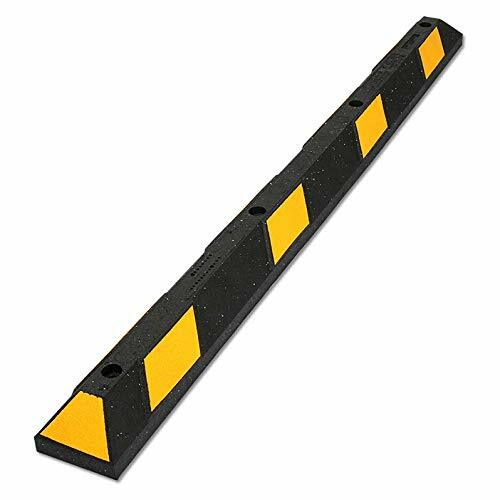 V-Loc's flush-to-the-ground anchor allows sign posts to breakaway or release cleanly at ground-level, with a 360 degree impact zone. Includes wedge, post anchor. Use for 3-inches diameter round posts going into concrete.